It’s important to focus on the CIA — while the other agencies involved in the war on Cuba during JFK’s administration need similar scrutiny. Photo credit: Adapted by WhoWhatWhy from Tullio Saba / Flickr and CIA / Wikimedia. Bill Simpich is a civil rights attorney in the San Francisco Bay Area. He is on the board of directors of the Mary Ferrell Foundation, an organization focused on the study of documents related to the 1960s assassinations, Watergate, and Iran-Contra. In the following essay, he offers a look at some of the gems found in the new JFK document releases and how to speed up the discovery of future finds. More than 50 years after the assassination of President John F. Kennedy, thousands of government documents related to his death are still under classified lock and key. By law, all of the remaining secret documents were supposed to have been released last year. President Donald Trump approved the release of approximately 35,000 files in 2017. But he delayed the publication of many other documents in full or in part until 2021 — when the winner of the 2020 presidential election will have another chance to review them for possible declassification. Researchers have been digging through the released documents in search of a “smoking gun” file which neatly explains to skeptics what really happened that dark day in Dallas. While it’s possible such a document exists, it’s unlikely. The difficult job of understanding why a president was murdered, and unpacking the Cold War path that America was treading, involves working through the minutiae — the “boring” material — so that the little puzzle pieces can fit together to form a coherent bigger picture. One year ago this week, the National Archives and Records Administration released the first of what were to be seven batches of newly declassified documents. Some of those documents had actually been released in past decades, albeit with extensive redactions. Others had never been seen before. Analysis of the newly available documents, including those released in the 1990s — most of which still remain undigitized — are already shedding light on the murky background of President Kennedy’s murder. Among other things, the findings offer a golden opportunity to unpack more of the hidden history of the Cold War, revise our assumptions about that fraught era, and — finally — get the story right. There will be no new document releases until 2021. That gives us three years to digest what we already have, and to create some stronger tools for analysis. But the work of researchers and interested citizens is already paying off. 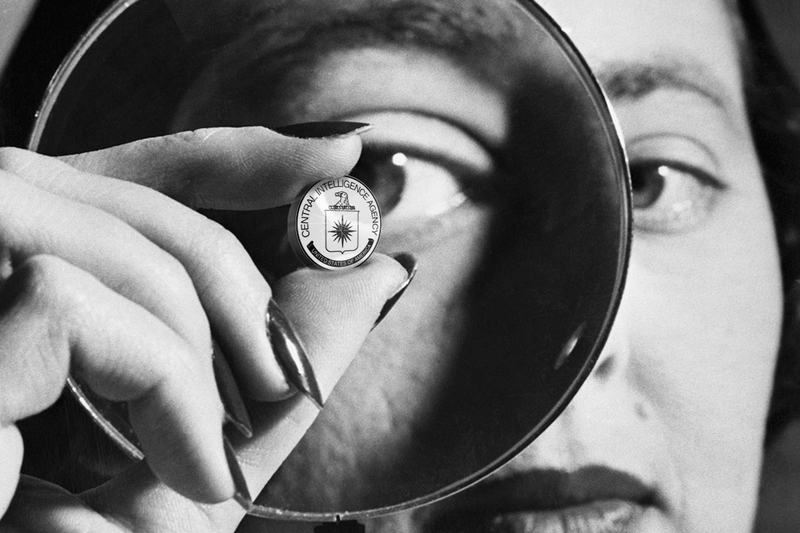 Take the ongoing research on cryptonyms, or crypts — government codewords for people, places, and things that the intelligence community meant to keep hidden. As someone who has spent a lot of time solving CIA cryptonyms for the Mary Ferrell Foundation (MFF) website, one of the premier online digital archives of JFK documents, let me say a brief word on why decoding the cryptonyms is important. When you know the names of the CIA programs, officers, and agents whose names are hidden, a whole new way of seeing the world opens up to you. Cryptonyms usually begin with a two-letter prefix that identifies the country of origin (e.g., “AM” for Cuba or “LI” for Mexico), and then the remainder of the word reveals the program (e.g., AMCANOE refers to a project to unify exiles, many of whom had traveled by water from Cuba into the US). 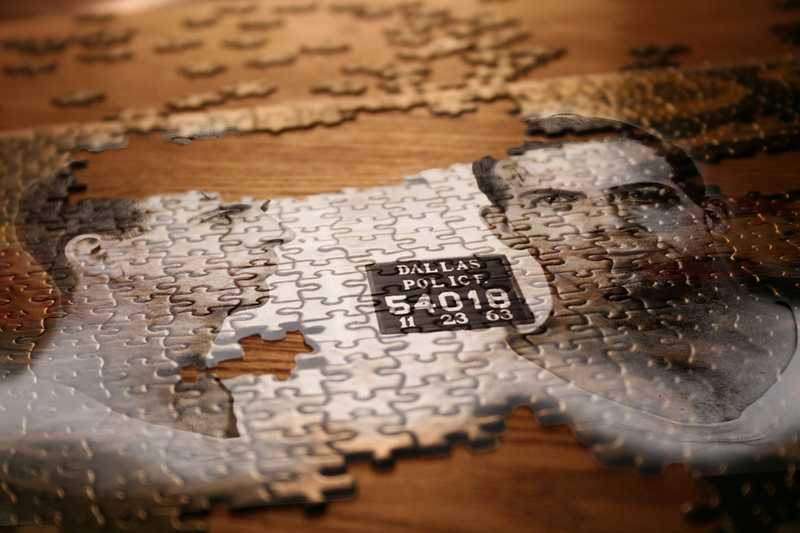 The JFK case is a jigsaw puzzle the size of a football field. Photo credit: Adapted by WhoWhatWhy from Jolene Faber / Flickr (CC BY 2.0) and ARCHIVES.GOV. LIOSAGE — a cryptonym long known to refer to an ally of Mexico City CIA station chief Win Scott — is now exposed as the handle for Carl Migdail, a journalist with the conservative US News & World Report and a contact of CIA propaganda specialist David Phillips. Migdail now joins a group of mainstream Miami journalists who were prized CIA assets: Al Burt (AMCARBON-1), Don Bohning (AMCARBON-3) and key CIA ally and source Hal Hendrix, almost certainly QDELF. ZRJEWEL was a paramilitary program in 1961 that included Rip Robertson, Grayston Lynch, and Lucien Conein. The confluence of these three men is important. Robertson and Lynch were the two Americans who led the Cuban troops at the Bay of Pigs. They entered this commando program that landed Cuban exiles back into Cuba after the Bay of Pigs was over. Lucien Conein, part of the same program, assisted the overthrow of the Diem brothers in early November 1963 in South Vietnam — which resulted in their assassination. Robertson was a close friend of David Morales, CIA’s chief of operations at its “forward base for Cuba” in Miami. Morales made provocative statements about his role in killing JFK before several articulate and credible witnesses interviewed by government investigator Gaeton Fonzi. As for Lynch, he never forgave the Kennedy brothers for what he considered their “betrayal” at the Bay of Pigs. For decades, researchers have investigated Souetre’s apparent presence in Dallas, on November 22, 1963, and his expulsion from the US immediately after the JFK assassination. The new FBI and CIA documents reveal more about intelligence efforts to locate Souetre in the US in the months before the assassination. What remains unclear is why he was expelled from the US, rather than arrested. A particularly amusing or intriguing one (depending on your perspective) is the organization TZFRESH — probably Brazilian intelligence — which was asked by the CIA to photograph the JFK researchers and Cuban counterintelligence officers that met together in August, 1995 in Rio de Janeiro pursuant to an invitation by the Ministry of Culture. One problem with the new batch of releases is that the government has re-redacted documents that had already been released! These new (different) redactions make it more difficult for a researcher to deduce what has already been released to the public. On the positive side, all redactions — old or new — do offer a little unintended transparency about what the government is trying to hide. One of the most curious episodes in the JFK case supposedly occurred two months before Kennedy’s assassination, when Lee Oswald is said to have visited the Soviet and Cuban consulates in Mexico City in an attempt to obtain visas to visit both nations. A November 23, 1963, document recounts the president of Mexico (LITENSOR — Adolfo Lopez Mateos) telling the Mexico City station chief Win Scott that their Mexico/US “joint operation” has found proof that Lee Oswald called the Soviet embassy on September 28, 1963. The newly released document has a redaction in the body of the memo — while an earlier version of the same document has none! Many of the new documents just fill in a couple blanks to useful documents that we already had. The above image illustrates why many researchers wonder if the wiretap transcripts referring to Oswald in Mexico City in 1963 are authentic. After all, why is the president of Mexico telling the CIA’s Win Scott about Oswald’s supposed call to the Soviet embassy on September 28? Shouldn’t the CIA have already known about it? The Soviets have no record of this call, as their embassy was closed for business that day and the wiretaps depict Soviet calls of a personal nature. The call supposedly originated from Oswald at the Cuban consulate — but the Cubans deny that their consulate was open that day, or that Oswald visited that day. (Oswald may have been impersonated on the telephone on September 28 — see the discussion in the preface to my online book State Secret). 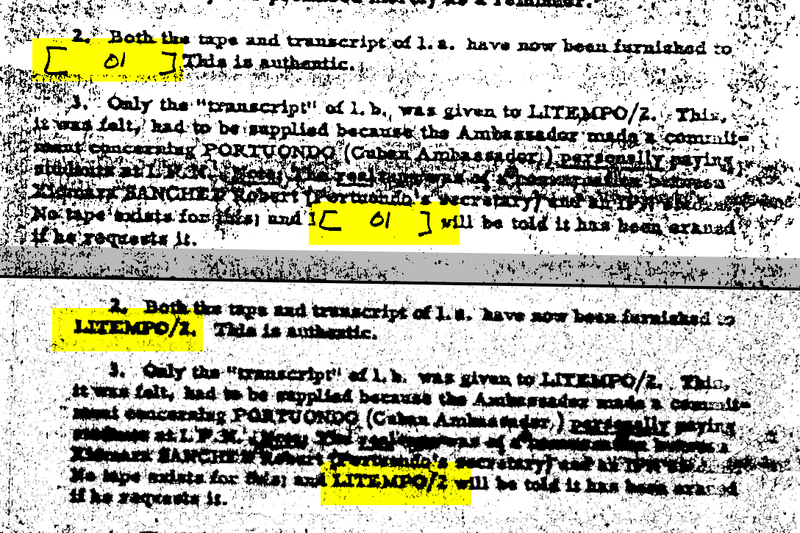 You have to wonder after reviewing a 1962 document showing that Mexico City Chief of Station Win Scott created a fake wiretap transcript and sent it to LITEMPO-2, also known as Gustavo Diaz Ordaz and the president of Mexico from 1964 to 1970. The biggest problem is to digest and analyze the documents that we now have. The MFF (Mary Ferrell Foundation) site has the documents that are the easiest to access — but only 20–30 percent of the JFK files are uploaded to the site, and not all of them are searchable. Many of the important facts residing in the MFF database are subtle and have to be teased out. When located, these hidden treasures need thoughtful care to integrate and organize. Suppose, for example, you wanted to research the activities of the US ultra-right. Here is what you might find on your line if you went fishing on your own — a convoluted cluster of facts strung together on a long string that ties in eventually with the Kennedy assassination. Documents released in the 1990s reveal that Marcos Diaz Lanz was AMOT-6 (one of the leading members of a group trained by David Morales to be a new Cuban intelligence service once Castro had been ousted), Marcos Diaz Lanz used the alias Pedro Garcia, was active with the Minutemen under the alias “Pedro Garcia”, and threatened to engage in armed insurrection with the Minutemen when President Lyndon B. Johnson defeated Sen. Barry Goldwater (R-AZ). Also: Marcos’s brother Pedro Diaz Lanz (AMOT-5) was active with the ultra-right-wing evangelist Billy Jean Hargis’s Christian Crusade. These facts don’t seem that significant until you consider that Pedro Diaz Lanz was the former chief of the Cuban Air Force … and was smuggled out of Cuba by the CIA’s aforementioned chief of operations in Miami, David Morales. As stated earlier, Morales has been quoted by several in his intimate circle as admitting a role in the Kennedy assassination. Another document shows that Morales’s frequent partner Tony Sforza was the case officer for Marcos Diaz Lanz/AMOT-6. 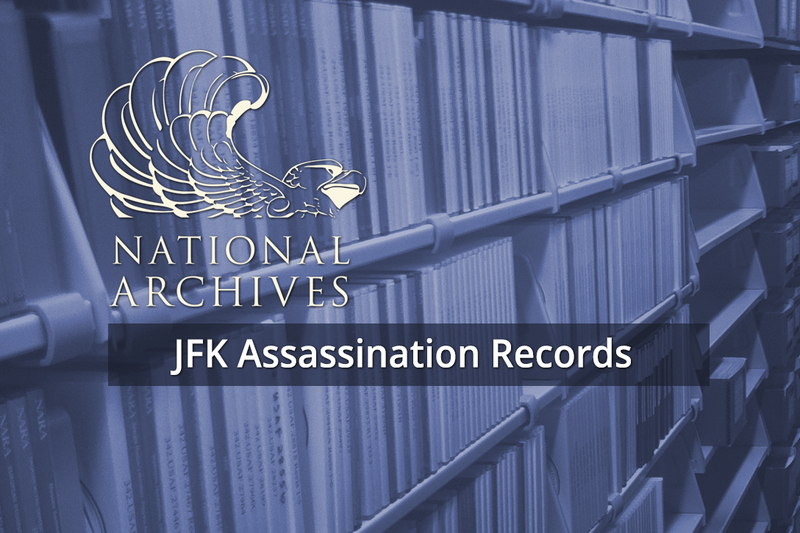 The National Archives are missing JFK records from military intelligence, NSA, and the Secret Service. Photo credit: Adapted by WhoWhatWhy from National Archives / Wikimedia) and Justin Grimes / Flickr (CC BY-SA 2.0). There are dozens of interviews with high intelligence officials within the 70–80 percent of the National Archives documents not yet available on MFF. MFF’s limited budget resources make it impossible to upload these documents at this time without outside assistance. The Dallas FBI file for the JFK assassination is a crucial source of information for the immediate hours and days after 12:30 PM on 11/22/63. The “Numbered Files” of the House Select Committee on Assassinations contain dozens of depositions of key CIA and FBI officials and other important discoveries. This is just some of the low-hanging fruit. If we scan the relevant documents in the National Archives and elsewhere, we will have a far more powerful database. There are other key databases at the Harold Weisberg Archive site, the National Security Archives, MuckRock, WhoWhatWhy’s JFK project, the Assassinations Archives Research Center, the presidential libraries, and elsewhere, but the importance of scanning new documents and increasing the ability to scan cannot be overemphasized. It is critical for all researchers and authors to support this effort by setting up websites, coming together in small groups whenever possible, scanning their work, and placing their research and archives online. Many of our best researchers will “age out” in the next 10–20 years — their discoveries should not be lost. Previous discoveries that need to be unearthed can be found at the archives of Penn Jones, John Armstrong, and other researchers, located at the Poage Legislative Library and full-text searchable. Although Poage is not accepting new archives at the present time, there are a myriad of ways to get it done. Holding on to this material for proprietary reasons is a bad idea and holds the work back. Researcher Bill Kelly suggests that the JFK research community is a citizen-based counterintelligence operation, responding to the work of the intelligence operations. When we strengthen our analysis of the new and recent JFK revelations, we come together as a vital force ready to take on our nation’s history and the challenges of the modern era. Related front page panorama photo credit: Adapted by WhoWhatWhy from Bill Simpich (JFKFacts.org) and National Archives (Mbell1975 / Wikimedia – CC BY-SA 3.0).